Herbmed is an ayurvedic medicine that contains Varuna (Crataeva nurvala) and banana stem (Musa paradisiaca). Researchers from AMAI Trust Multispecialty Hospital in Pune, India report the results of preliminary research in treating kidney stones. 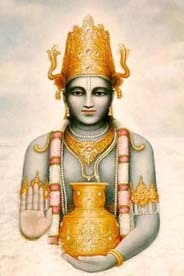 Varuna is a plant, and the bark or root bark are the source of the medicine. It has anti-inflammatory properties and is reportedly used to dissolve urinary calculi, although I couldn’t find other studies in people. Musa paradisiacal is commonly known as the banana plant, and best known as a source of potassium. 77 patients with kidney stones 5 mm or larger in diameter were randomly assigned to treatment. Each group was then assigned to treatment with Herbmed or placebo. Patients recorded the of number of pain episodes. Severity of pain was measured on visual analogue scale (VAS). Neither patients nor researchers knew the treatment given — double-blind. Treatment with Hebmed in the group with smaller stones was associated with a 33% reduction in the size of the stones vs a 5% increase with placebo — a significant difference. In the group with the larger kidney stones, there was an 11% reduction with treatment vs a 1% reduction with placebo. Pain was significantly less with treatment vs placebo at all times. The authors characterized the results as preliminary but positive, with regard to reducing the size of the stones and associated pain. Future studies might evaluate differences in the percent of patients who pass their kidney stones over time, and safety considerations — particularly during long-term treatment. A good overview of kidney stones and treatment options can be found at The Kidney Stone Web Site. This entry was posted on Tuesday, December 2nd, 2008 at 8:34 PM	and is filed under Ayurveda, Kidney Disease, Pain. You can follow any responses to this entry through the RSS 2.0 feed. You can leave a response, or trackback from your own site.